3Department of Physiology, Faculty of Science, University of Extremadura, Badajoz, Spain. Reactive Oxygen Species (ROS) trigger oxidative stress conditions which leads cellular damage. Oxidative stress is the unbalanced situation in favour to the oxidants. Free oxygen radicals, in unstable conditions, may function as signal transduction molecules. Transient Receptor Potential (TRP) channels, as Ca2+- permeable cation channels, that sense environmental changes, such as pH, temperature, chemical, etc. TRP channels attract scientist’s interest due to their vital role in cellular mechanisms, such as apoptosis, neural functions. The members of one subgroup of TRP channels have appeared as ROS sensors. The importance of antioxidants on Ca2+ signalling mechanisms, induced by the activation of ROS-sensitive TRP channels, under pathological conditions is still unclear. In the current mini-review, we aimed to summarize the importance of the antioxidants and their vital role on TRP channel activity. ROS-sensitive TRP channels poses extremely important role for future challenge which may lead to investigation and/or strategy to develop new therapeutic agents for the suppression and/or activation of ROS-related diseases. Calcium (Ca2+) is one of the most important universal ion for living cells and kept in low concentrations in the cytosol (80-100 nM) compared to extracellular milieu. Cell viability and lots of cellular functions are regulated by the balance between cytosolic and extracellular Ca2+ levels. Transient Ca2+ signals are key players of regulation of the intracellular Ca2+levels. Any alterations in the intracellular Ca2+ concentration ([Ca2+]i) depend on activation of cationic channels either intracellular stores or extracellular media to cytosol. Transient Receptor Potential (TRP) channels superfamily consists ofcommonly, Ca2+ permeable,non-selective cation channels including reactive oxygen species (ROS) sensitive melastatin like 2(TRPM2), vanilloid 1 (TRPV1) and ankyrin 1 (TRPA1) cation channel subtypes . The balance between oxidants and antioxidants determinestheredox status in the cells. Antioxidant defense has coupled mechanisms including the cell membrane and cytosolic components. When the lipid peroxidation is quenched by membrane antioxidants, enzymatic antioxidants scavenge the harmful ROS products in liquid phase [2,3]. Though, two parts of the defense contribute to realize an aim to prevent oxidative damage, it can change under exceptional conditions. Increased ROS production shifts the balance in favor of oxidants, and it initiates oxidative damage, which can directly affect essential organic substances of the cells such as nucleic acids, lipids, proteins and carbohydrates. Nervous system, especially brain is very vulnerable to oxidants because of its rich construction in polyunsaturated fatty acids (PUFA), which are particularly indefensible to free radical attack and high amount of oxygen consumption. Oxidative stress status can trigger several chemical reactions in the cells which can activate ROS sensitive TRP channels [4,5]. As a result of the irreversible cation channel activation, Ca2+ rapidly influx and the cell undergoes to apoptosis. Despite the fact that numerous channel blockers of these channels have been discovered, none of them can completely block the channel. Since a decade, a novel approachhascome out to ROS activated TRP channels inhibition by antioxidants. There is an increasing number of studiesfocusing on powerful antioxidants properties of chemical compounds including herbal extracts. Indirectly, researchers have been focused on indirectly inhibition of TRPM2 channel currents by antioxidants and element cofactorsof antioxidant enzymes (GSH-Px; selenium and SOD; copper) because of their scavenging ability to ROS scavenging ability in cellular compartments. Hence, in this manuscript we aimed to summarize that the effects of some antioxidants on TRP channel gating manner. TRPA1 channels are expressed in a very similar localization of TRPV1. Similarly, TRPV1 can be localized in Dorsal Root Ganglia (DRG), Trigeminal Ganglia (TG), Nodose Ganglia (NG), brainand nonneuronal tissues such as lung, pancreas, skeletal muscle and heart.TRPA1 channels can be opened by low temperature (T<18°C) and by chemicals,such as allylisothiocyanate (mustard oil), allicin, carvacrol, icilin, cinnamaldehyde, eugenol, gingerol . TRPA1 channels are responsible for itch behaviour in rats.Inhibition of TRPA1 channel currents by antioxidants considered to therapy for itch . It is well-known; TRPA1 activation is affected by oxidative stress. However, little is known about lonely TRPA1 channels and antioxidants interaction in literature. Studies have investigated the effects of antioxidants on TRPA1 channels together with TRPV1 channels. It has been proposed that dihydroxy carotenoid lutein selectively inhibits TRPA1 currents and has antiinflammatory properties in a neurogenic inflammation study . Another study showed an inhibition ofTRPA1 current by the presence of powerful antioxidant resveratrol (30 μM). Moreover, this study also implied that the anti-nociceptive effects of resveratrol are due to the inhibitory effect on TRPA1 channels . TRPM2 channels are abundantly expressed in brain and peripheral tissues such as bone marrow, pituitary, blood and spleen . TRPM2 gating by a unique mechanism because ofenzymatic activity in the C-terminal of the channel, describes ADPR pyrophosphatase domain . TRPM2 channels can be activated by mostly adenosine diphosphate ribose (ADPR), nicotinic acid adenine dinucleotide (β-NAD+), cyclic ADPR (cADPR) and independently by oxidative stress (H2O2) [12,13]. The studies also have been targeted to suppress ADPR production via ROS related initiation of poly ADPR polymerase (PARP) pathways.In an in vitro study, it has been reported that vitamin E, C and reduced glutathione (GSH) had not inhibitor effects on TRPM2 cation channel currents inhibition , but in similar two studies, selenium (Se) incubation (100 nM, for 36-48 h)and a potent antioxidant melatonin administration act as inhibitor on TRPM2 gating in transfected CHO line [15,16]. Another antioxidant, curcumin preincubation (5 μM, for 15 min), inhibits TRPM2 cationic currents in transfected HEK293 cells and rat cultured hepatocytes . In a study it has been resulted that 10 μM copper (Cu) administration during the records potently blocked ADPR evoked TRPM2 currents in transfected HEK293 cells . Inhibitor effects of vitamin Eand GSH also have been shown in DRG neurons. In another study, it was concluded that melatonin (5 mg/kg body weight) plays regulator role of TRPM2 channel currents regulation in hippocampal neurons in traumatic brain injury induced rats . Moreover, it has been suggested that besides the antioxidants also plant extracts such as Hypericum perforatum L. (St John's wort) extract inhibit Ca2+ mobilization in DRG neurons. Hypericum perforatum L. extract also inhibits Ca2+ signals in neutrophils from suffering Behcet’s disease and protects the cells against to oxidative stress induced TRPM2 activated cell death [20,21] (Figure 1). Figure 1. 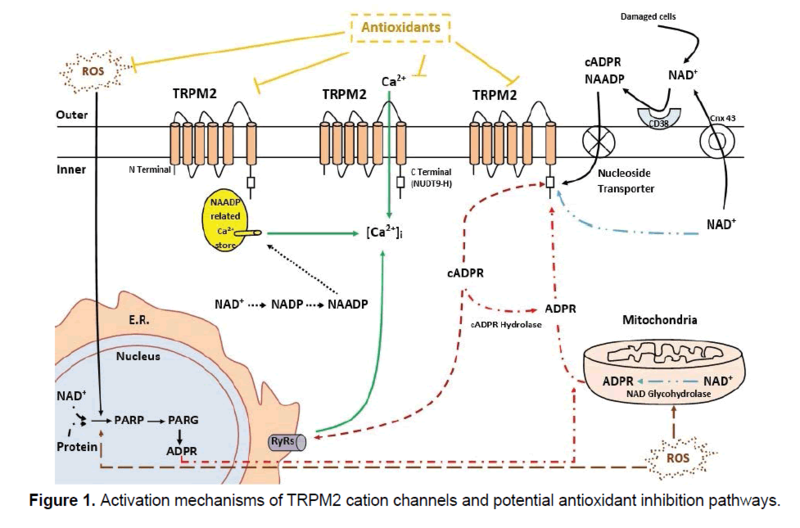 Activation mechanisms of TRPM2 cation channels and potential antioxidant inhibition pathways. TRPV1 channels are highly expressed in central and peripheral nervous system components such as hypothalamus, cerebellum, cerebral cortex, hippocampus, thalamus, substantia nigra, TG, NG, DRG and peptidergic neurons which are responsible for neurogenic pain . TRPV1 channels can be activated by noxious temperature (T>43°C) and by some chemicals such as capsaicin and resiniferatoxin of vanilloids and by fatty acid derives including anandamide, N-acylethanolamines and N-arachidonoyl dopamine . It has been revealed that TRPV1 channels are related with nociception and neuropathic pain in knock-out animal studies [24,25]. It was demonstrated that; pre-incubation with vitamin E during 72 h, can inhibit TRPV1 mediated Ca2+release in cultured hippocampal neurons of rats . In a pain study, it is concluded that eriodictyol could induce antinociception by directly antagonizing the TRPV1 channel as well as by protect cells to harmful effects of ROS .In another itch behaviour study, it was demonstrated that 1 mM caffeic acid inhibited TRPV1 activation both in transfected HEK293 cells and DRG neurons. Furthermore, this study have been performed the experimental procedure also for TRPA1 channels and the results found very similar to TRPV1 . Se, as well as a cofactor of GSH-Px enzyme, used in studies as an antioxidant and TRP channel regulator. It was shown that Seincubation (200 nM, for 2 h) has potential inhibitor activities on Ca2+ influx through TRPV1 channels in neutrophils of polycystic ovary syndrome (PCOS) patients . Similar study, it was also shown that daily 600 mg N-acetylcysteine (NAC) treatment during six weeks can be reduced Ca2+signals through TRPV1 channels in neutrophils of PCOS patients . ROS sensor TRP channels are thought to actively participate in the neurological cell apoptosis processes. Recent studies have shown that these channels have not only related to the neurological cells, but also to different systemic or local diseases progression . More than few reports about the relationship between ROS and TRP channels indicate that antioxidants can provide alternative regulation mechanisms on TRP channel gating. Antioxidants are more applicable than the knownion channel blockers to human body involving reduced side effects because of their low toxicity or even innocuousness . Although, the studies are directly focused on the gating of TRP channels, being neglected whether the side effects are or not compromising the cellular viability . The studies targeting redox status interaction with gating mechanisms of TRP channel on neurological diseases and other TRP channelrelated disorders are currently scarce. The gating modulation of TRP channel by redox status suggests antioxidant molecules as an alternative and harmless treatment for TRP channel-related diseases. The graphical abstract illustrated by Ahmi ÖZ. Clapham DE. (2003). TRP channels as cellular sensors. Nature. 426: 517-524. Krinsky NI. (1988). Membrane antioxidants. Ann N Y Acad Sci. 551: 17-32. Krinsky NI. (1992). Mechanism of action of biological antioxidants. Exp Biol Med. 200: 248-254. Halliwell B. (2006). Oxidative stress and neurodegeneration: where are we now? J Neurochem. 97: 1634-1658. Groschner K, Rosker C, Lukas M. (2004). Role of TRP channels in oxidative stress. Novartis Foundation Symposium, Chichester, New York, John Wiley. Clapham DE. (2007). SnapShot: Mammalian TRP channels. Cell. 129: 220. Liu T, Ji RR. (2012). Oxidative stress induces itch via activation of transient receptor potential subtype ankyrin 1 in mice. Neurosci Bull. 28: 145-154. HorvÃÂ¡th G, KemÃÂ©ny ÃÂ, BarthÃÂ³ L, et al. (2015). Effects of some natural carotenoids on TRPA1-and TRPV1-induced neurogenic inflammatory processes in vivo in the mouse skin. J Mol Neurosci. 56: 113-121. Yu L, Wang S, Kogure Y, et al. (2013). Modulation of TRP channels by resveratrol and other stilbenoids. Mol Pain. 9: 1. Fonfria E, Murdock PR, Cusdin FS, et al. (2006). Tissue distribution profiles of the human TRPM cation channel family. J Recept Signal Transduct. 26: 159-178. Perraud AL, Fleig A, Dunn CA, et al. (2001). ADP-ribose gating of the calcium-permeable LTRPC2 channel revealed by Nudix motif homology. Nature. 411: 595-599. Ramsey IS, Delling M, Clapham DE. (2006). An introduction to TRP channels. Annu Rev Physiol. 68: 619-647. Naziroglu M, LÃÂ¼ckhoff A. (2008). A calcium influx pathway regulated separately by oxidative stress and ADP-Ribose in TRPM2 channels: Single channel events. Neurochem Res. 33: 1256-1262. Naziroglu M, LÃÂ¼ckhoff A. (2008). Effects of antioxidants on calcium influx through TRPM2 channels in transfected cells activated by hydrogen peroxide. J Neurol Sci. 270: 152-158. Naziroglu M, ÃÂzgÃÂ¼l C, KÃÂ¼ÃÂ§ÃÂ¼kayaz M, et al. (2013). Selenium modulates oxidative stress-induced TRPM2 cation channel currents in transfected Chinese Hamster ovary cells. Basic Clin Pharmacol Toxicol. 112: 96-102. ÃÂelik ÃÂ, Naziroglu M. (2012). Melatonin modulates apoptosis and TRPM2 channels in transfected cells activated by oxidative stress. Physiol Behav. 107: 458-465. Kheradpezhouh E, Barritt GJ, Rychkov GY. (2016). Curcumin inhibits activation of TRPM2 channels in rat hepatocytes. Redox Biol. 7: 1-7. Zeng B, Chen GL, Xu SZ. (2012). Divalent copper is a potent extracellular blocker for TRPM2 channel. Biochem Biophys Res Commun. 424: 279-284. Naziroglu M, Ozgul C. (2013). Vitamin E modulates oxidative stress and protein kinase C activator (PMA)-induced TRPM2 channel gate in dorsal root ganglion of rats. J Bioenerg Biomembr. 45: 541-549. Naziroglu M, Sahin M, Cig B, et al. (2014). Hypericum perforatum modulates apoptosis and calcium mobilization through voltage-gated and TRPM2 calcium channels in neutrophil of patients with Behcet's disease. J Membr Biol. 247: 253-262. YÃÂ¼rÃÂ¼ker V, Naziroglu M, Senol N. (2015). Reduction in traumatic brain injury-induced oxidative stress, apoptosis, and calcium entry in rat hippocampus by melatonin: Possible involvement of TRPM2 channels. Metab Brain Dis. 30: 223-231. Pingle S, Matta J, Ahern G. (2007). Capsaicin receptor: TRPV1 a promiscuous TRP channel. Transient Receptor Potential (TRP) Channels: Springer. 155-171. Kurogi M, Kawai Y, Nagatomo K, et al. (2014). Auto-oxidation products of epigallocatechin gallate activate TRPA1 and TRPV1 in sensory neurons. Chem Senses. 57. Caterina MJ, Leffler A, Malmberg A, et al. (2000). Impaired nociception and pain sensation in mice lacking the capsaicin receptor. Science. 288: 306-313. BÃÂ¶lcskei K, Helyes Z, SzabÃÂ³ ÃÂ, et al. (2005). Investigation of the role of TRPV1 receptors in acute and chronic nociceptive processes using gene-deficient mice. Pain. 117: 368-376. Crouzin N, de Jesus Ferreira MC, Cohen-Solal C, et al. (2010). Neuroprotection induced by vitamin E against oxidative stress in hippocampal neurons: involvement of TRPV1 channels. Mol Nutr Food Res. 54: 496-505. Rossato MF, Trevisan G, Walker CIB, et al. (2011). Eriodictyol: A flavonoid antagonist of the TRPV1 receptor with antioxidant activity. Biochem Pharmacol. 81: 544-551. Pradhananga S, Shim WS. (2015). Caffeic acid exhibits anti-pruritic effects by inhibition of multiple itch transmission pathways in mice. Eur J Pharmacol. 762: 313-321. KÃÂ¶se SA, Naziroglu M. (2014). Selenium reduces oxidative stress and calcium entry through TRPV1 channels in the neutrophils of patients with polycystic ovary syndrome. Biol Trace Elem Res. 158: 136-142. KÃÂ¶se S, Naziroglu M. (2015). N-acetyl cysteine reduces oxidative toxicity, apoptosis and calcium entry through TRPV1 channels in the neutrophils of patients with polycystic ovary syndrome. Free Radic Res. 49: 338-346. Nilius B, Owsianik G. (2010). Transient receptor potential channelopathies. Pflugers Arch. 460: 437-450. Arroyo AM, Kao LW. (2009). Calcium channel blocker toxicity. Pediatr Emerg Care. 25: 532-538. Vay L, Gu C, McNaughton PA. (2010). Current perspectives on the modulation of thermo-TRP channels: New advances and therapeutic implications. Expert Rev Clin Pharmacol. 3: 687-704.